The market can’t say it didn’t see it coming. The Federal Reserve had been talking about raising rates for more than a year. And yet, as the Fed finally moved, the 0.25 increase in the Federal Funds rate wasn’t exactly priced in. Since Dec. 16, the day of the announcement, the S&P 500 has lost 8 percent. “It seems to me that Janet Yellen and her confreres at the Federal Reserve simply missed their mark. They might’ve raised rates but didn’t in 2014 or 2013 and meanwhile … the economic situation weakened in 2015,” said James Grant, chief editor of Grant’s Interest Rate Observer. GDP only grew 0.7 percent annualized in the fourth quarter of 2015 compared to 2 percent in the third quarter, a clear slowdown. The two other measures the Fed watches closely when making interest rate decisions, inflation and unemployment, did not call for an increase in rates. Inflation is much lower than the 2 percent target and unemployment not low enough to reflect an overheating of the labor market. But the Fed had to follow through on its promise to raise rates in 2015. The whole world is counting on the United States for growth. “The Fed, having been on record as wanting to raise rates in 2015, having invested some measure of its prestige in following through finally, almost as mercy to us who were tired of listening to it, chose to raise that one little rate one little quarter of 1 percent in December,” said Grant. It had previously intended to raise rates at its September meeting but chose to hold off because of problems in China. “It’s the biggest reason why the Fed took so long to raise rates, it’s the biggest reason why the Fed is not going to raise rates in a hurry. The whole world is counting on the United States for growth,” said Joseph Gagnon, a senior fellow at the Peterson Institute for International Economics and former associate director at the Federal Reserve board. China surprised global markets by devaluing its currency in August without warning, although only by a small amount. Since then, the Chinese economy has slowed, capital is moving out of the country, and the currency has weakened further. Not good news for the United States and not very conducive for future rate hikes. “It’s bad for the United States, it’s holding our recovery back. Exports are declining. It’s the biggest drag on our economy for the past two years and it’s going to continue for another year at least,” said Gagnon. 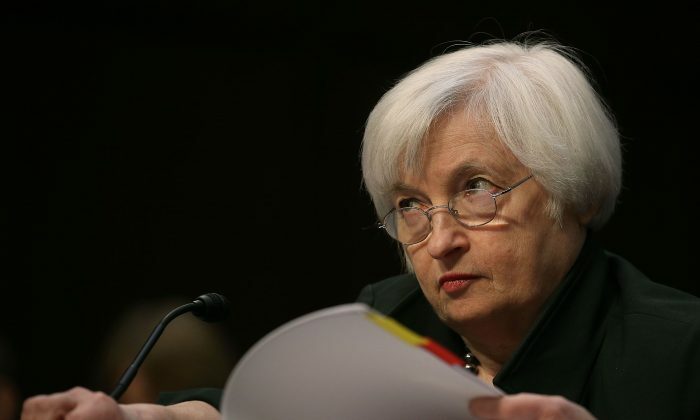 The Fed had previously indicated it intends to raise rates four more times in 2016. According to Grant, it was this language that prompted the market to sell off in the beginning of 2016. Was China the Reason the Fed Didn’t Hike Rates? “‘But four more? Four more moves in this world?’ said the market to itself. This is a demonstration of the failure of the very institution of discretionary management of monetary affairs by this hand-picked … former tenured economics professors who run monetary policy,” he said. For Gagnon, there is another issue, which makes this series of rate hikes different from before. Before, other developed markets such as Europe and Japan had synced their rate cycles with the United States. Now they push rates into negative territory and implement quantitative easing.